28 August 2017: The 67th session of the World Health Organization (WHO) Regional Committee for Africa takes place in Victoria Falls, Zimbabwe, from 28 August to 1 September 2017. The Regional Committee, comprising health ministers from the 47 countries in the Region, is the Governing Body of WHO in the African Region. The UICC is a membership organisation representing 159 cancer organisations across the African Region. South Africa’s Minister of Health, Aaron Motsoaledi, challenged the Africa region to address non-communicable diseases once and for all, and highlighted cancer and diabetes. He also drew attention to high levels of sugar in beverages, as a contributor to these NCD’s. 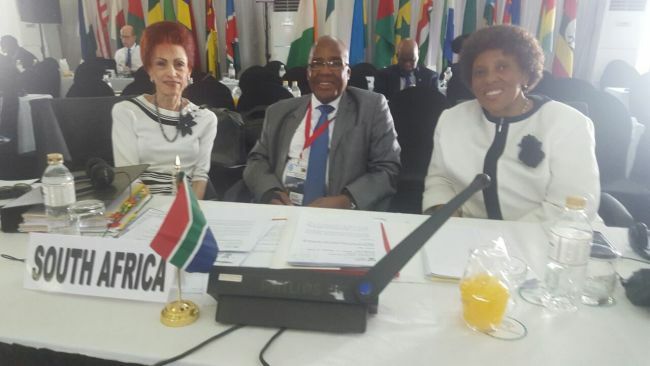 Elize Joubert, CANSA CEO, seen with SA’s Minister Health & Director General DOH, at the 67th session of the World Health Organisation Regional Committee for Africa in Zimbabwe.